Pillar Ministries currently has 19 congregations in Liberia, with individual church membership ranging anywhere from 15 to 65 people. Pillar Missions is committed to providing quality Christian education for the children of Liberia. Liberia’s children are essential to the continued recovery and rebuilding of the nation, as they are the country’s next generation of leaders. We believe that quality Christian schools will produce quality Christian leaders with a passion for impacting their communities, and in turn their country, with the life-changing love and freedom available in Christ. 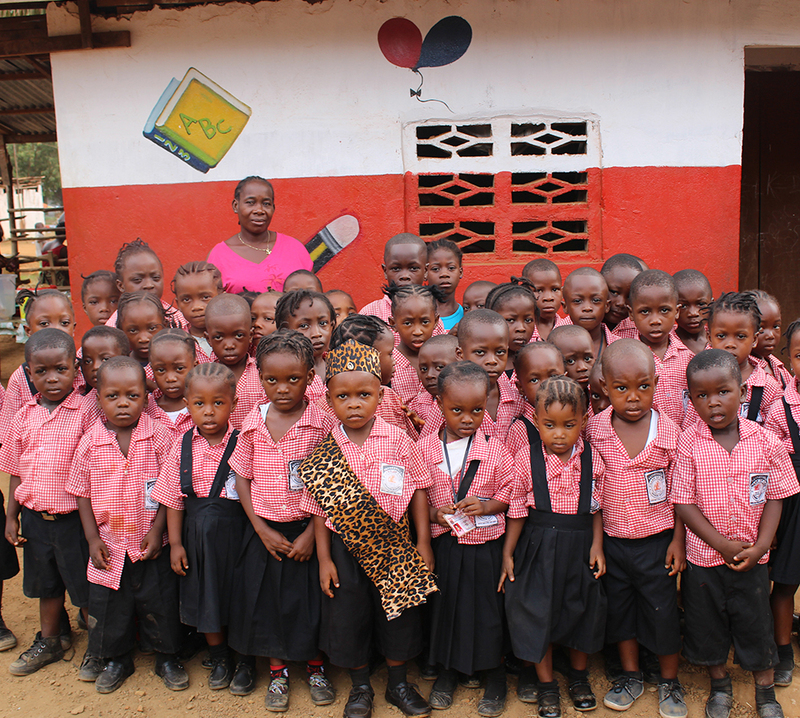 Pillar Ministries operates schools in two locations within Liberia: Buchanan and the Po River Beach area. The school in Buchanan consists of both an elementary school and a high school, with a combined total of about 240 students. The Po River school has about 90 students, from kindergarten up through 9th grade. In recent years, the school in Buchanan has experienced a tremendous growth in its student body, and the current elementary school building is no longer adequate to support the school. Plans are underway to build a new elementary school. To learn more about this project, please see the Project Buchanan section. The first Pillar Ministries church in Liberia was established in the 1950’s in the Po River Beach area by John Potee, a native Liberian. By 1963, the church had spread to several other locations within the country. Throughout the 1960’s Pillar Ministries sent various missionaries from both England and the US to assist in the work being done in Liberia. Due to the political unrest and eventual breakout of war in Liberia in the 1980’s and 1990’s, Pillar Ministries missionaries found it necessary to leave the country for their own safety. As with most of the country, during this time of war many Pillar Ministries congregations were ransacked by rebels and partially destroyed. Equipment such as cars, boats, tools and power generators were either stolen or destroyed. Currently, Liberia is in the process of recovering from almost two decades of destruction, violence and upheaval that left homes, lives and families shattered. Pillar Ministries churches and schools are once again operating; seeking to provide the people of Liberia with the love, freedom and hope found only in Jesus Christ. Make A Gift To Liberia! Liberia is currently recovering from almost two decades of political upheaval and civil war. These years were marked by ruthless destruction of life and property, massive population displacement, and a collapse of basic social services. Today under a new government the security situation has improved considerably, but the rebuilding of the country’s infrastructure has only just begun. January 7 – January 18, 2010 A team of 6 have set off on an 11 day journey to Liberia, Africa. The Group will participate in a Pillar Ministries annual Church Conference where team members will have the opportunity to meet the leaders of 21 Pillar Ministries churches in Liberia. The group also has plans to visit various POF Liberia ministry locations like the 300 pupil Elementary School in Buchanan. They will attend strategic planning meetings in regards to Project Buchanan, a school project which is now in the construction phase of a 200 student High School and they will participate in the laying of concrete blocks in the construction of the new school. The members of the team will serve helping to provide care for the sick in the Christian Extension Ministry Medical Clinic, which serves the people of Buchanan. The team will also visit the original site in River Cess, Liberia where the Pillar Ministries first began its missionary efforts in 1963. Project Buchanan is a building project whose goal is to help expand and improve the existing Pillar Mission school in the town of Buchanan. The project is focused on the development and construction of school facilities. In any country, children hold the keys to the future, and providing them with an education helps to ensure a brighter future not only for each child, but for the entire country. Education also helps to break the cycle of poverty. In a country where 90% of the population lives below the poverty line, and 85% are unemployed, education is key to providing hope and relief to a struggling people. Oceanview Christian School at Buchanan consists of about 135 students, from kindergarten up through 12th grade. Oceanview Christian School is well-known and highly respected in the community. In 2017, all of the senior high 12th grade students passed the standardized West African high school exam, a prerequisite for college enrollment. Standardized national exams are conducted for both 9th and 12th grade students and we are pleased to report that all of the 9th grade students also passed the exam. This major achievement for both the students and the reputation of the school. That standard of excellence continues. In August of 2008, a 10-acre plot of land was purchased as the grounds of the new high school. Construction of the initial buildings began in 2010. The old school location has one building for the early elementary classes. The new campus has four buildings, the first building upon entering the campus is an administration building, the second building is a 4 classroom structure for the high school, the third building is a lavatory building with modern toilet facilities and running water, the fourth building is a 4 classroom Jr. High which also houses some of the higher elementary classes. All of the buildings have light and power. In addition to the four buildings a new clean water well and water tower was installed along with a small generator room so that the campus has running water, flush toilets and on-campus light and power. In spite of the Ebola crisis which occurred in 2014 work continued on the project. During the summer of 2017 the construction of a new building which will function a both a chapel and auditorium was started. The work on that building continued in the winter of 2018 where the floor slab was started. As of this winter 2019 this building has a roof we anticipate the building shell to be completed during 2019 with windows and doors installed. We also completed a new road access to the site since the path we had been using was blocked by construction of a new house. Funds are still needed for the completion of the finish work on this new chapel building. We would also like to construct another classroom building to accommodate the early elementary classes and to construct some recreational elements like a basketball court and soccer field. All of the progress made toward Project Buchanan has been possible because of the prayers and financial support of friends like you. Much has been done already, but we still have a long way to go to complete the vision of providing quality educational facilities for the children of Liberia. Please consider making a gift to Project Buchanan to give hope and a brighter future to the children of Liberia. To view the history of Project Buchanan, click here.